When in Prague Castle in April 2010 the US and Russian Presidents signed the latest Strategic Arms Reduction Treaty (START), it stirred memories of how terrifying the world was 30 years ago, especially for folk in the know. From Hiroshima in 1945 till the fall of the Berlin Wall in 1989, the fear of atomic death for all your little chickens and their dam was the curse of an otherwise cheerful age. But by the late 1970s, the risk had become hair-raising. Intercontinental missiles were getting so sophisticated and accurate that both the USA and Soviet Union had good reason to fear that the other could attempt a surprise counterforce strike against the nuclear weapons in their missile silos and bomber bases – in the hope of coming off less badly in the unrestrained war that would follow. If you thought that was happening, simple logic then said that you had to get your own missiles launched before they were “dug out”. Decision times were limited by the few minutes remaining between the detection and arrival of incoming warheads. “Nuclear Nightmares: The Wars That Must Never Happen”, BBC-TV 1979, was produced and directed by Peter Batty and written by Nigel Calder. Made at precisely that critical stage of the Cold War, and filmed with operational forces and in command bunkers across Europe and the USA, the documentary explored four possible routes to nuclear war. Each segment ended with a fictional survivor sitting in a fallout shelter and explaining what went wrong. The culminating scenario concerned an all-out nuclear exchange between the USA and the Soviet Union. On Day Three, the Russians set in motion a huge civil defence exercise. “That is scary,” said the Americans, and put their bombers on Generated Alert. “The Americans are warmongering,” said Russians and sent their submarines out to sea. In an effort to bring down the temperature, the American President left his command centre and ostentatiously undertook all sorts of civilian duties. And he ended the day with the civilian supper which was interrupted. “I want an immediate decision to execute,” said the Secretary of Defense. “Now all you have to say is Tripoli, sir,” said the Defense Secretary. “Do the people know what’s happening?” asked the President as he was hurried to safety. A Western expert on Soviet military thinking, John Erickson of Edinburgh University, conveyed his deep pessimism in “Nuclear Nightmares”. He said: “In the next five years I think it’s possible to state almost statistically that the risk of nuclear war is quite considerable.” In other words, the apocalypse was not at all unlikely. 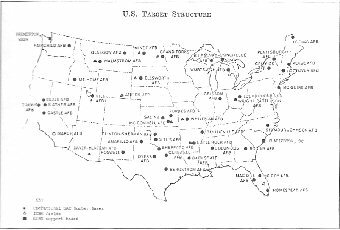 The accompanying book, also called Nuclear Nightmares, included this US Congressional map of the prime targets in the USA for any Soviet counterforce “first strike”. Bases are for bombers (circles), missiles (triangles) and submarines (squares). 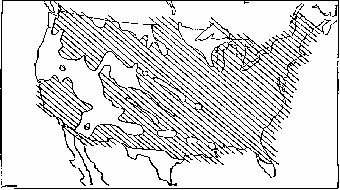 ... and another map of predictions from a hypothetical general war game showing where exposed citizens would suffer radiation sickness from radioactive fallout. Until closely guarded secrets trickled out towards the end of the century, neither Prof. Erickson nor the programme-makers knew how nearly right they were in 1979. Two years later, paranoid old men in the Kremlin ordered the Soviet intelligence services to watch for any sign that the West was about to launch a surprise counterforce attack, so that they might pre-empt it. In late October 1983, a big increase in cipher traffic between London and Washington aroused their suspicions. In reality it related to an American invasion of Grenada, but just days later, in early November, senior politicians and military commanders in the USA and Western Europe took part in something much more relevant. The war game called Able Archer 83 aimed to test the communications systems required for any NATO decision to use its new Pershing nuclear missiles after the outbreak of a ground war in Europe. The “game” seemed far too realistic to the watchful spies. For chess players in the Kremlin hierarchy a subtler theory was that the exercise itself was a feint, to cover a counterforce strike against the Soviet Union. If so, they ought to hit the Western forces first. Soviet bombers, and presumably missile launchers too, were readied for action. The danger abated only when Able Archer 83 ended as suddenly as it had begun. It was, after all, only an exercise and participating politicians like Ronald Reagan, Margaret Thatcher and Helmut Kohl had better things to do. Surprised and appalled to learn from a double agent just how genuinely frightened the Soviet leadership had been, President Reagan began the process of face-to-face negotiation that would eventually end the Cold War. Discussions about curbing the arms race, and actually getting rid of a lot of nuclear weapons had already begun but, amid deep mutual suspicions, verification was a tough issue. The first START Treaty eventually came into force in 2001. Many bombers and missiles were scrapped and most of the superpowers’ strategic nuclear weapons were eliminated. But that treaty expired in 2009 and the impact of the new START will be less dramatic. At least it keeps the world’s biggest nuclear arsenals shrinking a little, at a time when non-proliferation policies are faltering. “The nuclear epidemic” spreading deadly weaponry to “rogue states” and terrorist groups was the 1979 terminology for what inspires the most vivid nightmares now – and the theme of the 47-nation Nuclear Security Summit convened by President Obama in April 2010. “Nuclear Nightmares: The Wars That Must Never Happen”: a 90-minute TV documentary programme made by the BBC as a co-production with Palm Productions for transmission by WNET New York and Antenne 2 Paris. Produced and directed by Peter Batty, presented by Peter Ustinov and written by Nigel Calder, it was first broadcast in November 1979. Not to be confused with a 2006 BBC programme about reactor accidents, also called “Nuclear Nightmares”. Nuclear Nightmares: an investigation into possible wars by Nigel Calder, BBC Publications, Viking, etc., 1979. This entry was posted on Saturday, May 1st, 2010 at 17:10 and is filed under 2) PREDICTIONS REVISITED. You can follow any responses to this entry through the RSS 2.0 feed. You can leave a response, or trackback from your own site. Dear Mr.Calder, I’m very impressed by your blog. I’d like to post your link on our website. It is reliable source on Czech Republic. I would love to see the TV version of this – any ideas where it can be found would be most welcome.